Former Irish rugby international Alan Quinlan will be with the National Dairy Council sharing his health and fitness tips, on the first day of the 2015 National Ploughing Championships. 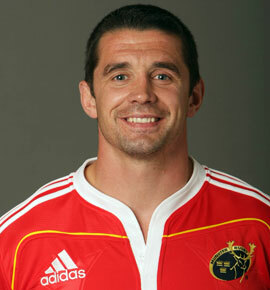 Originally from Tipperary, Alan Quinlan first played rugby for Ireland in October 1999 and played his first Six Nations match against Italy in 2001. He was part of Ireland’s squad at the 2003 Rugby World Cup in Australia and will be providing insights into the current World Cup campaign. Ten times All-Ireland hurling champion Henry Shefflin will be with the National Dairy Council on Wednesday from 10am to 1pm. Both Quinlan and Shefflin will share fitness and sports nutrition tip and will help to highlight ‘Win With Dairy,’ the NDC’s national campaign this autumn which celebrates the positive role that milk can play in sports nutrition, at whatever level you play or enjoy sports. ‘Win With Dairy’ is part of a nutrition-led strategy which embraces the versatile role of dairy throughout our life-stages. Broadcaster and designer Brendan Courtney joins the National Dairy Council at the National Ploughing Championships on Day 3, Thursday 24th September from 12 noon until 3.00pm. Courtney will highlight the expansion of the range of consumer leaflets on ‘Nutrition and You’ from the NDC which are supported by the INDI (Irish Nutrition and Dietetic Institute). The series now features nutritional information tailored for children, for adults and for the 50 plua age group. Daily cookery demonstrations by well-known chef Brian McDermott at the NDC Dome will highlight the Winning Taste of Dairy with plenty of recipes to tantalise the taste buds. Brian McDermott is a resident chef on RTE’s Today Show, has presented his own weekly cookery slot on BBC Radio Foyle and is a regular contributor to many national events and press titles. He has been cooking professionally for over 25 years and also runs his own cookery school in Moville, Inishowen, Co. Donegal. Brian is passionate about using local produce and cooking ‘honest’ food with no hidden ingredients or added salt. “I let the ingredients speak for themselves by using herbs and spices that complement, but don’t overshadow the main dish,” he said. The free cookery demonstrations will take place each day of the ploughing at the NDC Dome at 11.00am, 1.00pm, 2.30pm and 3.30pm. A flavour for the innovative, expanding and diverse ranges of dairy products available to consumers will be celebrated with a new exhibition from a selection of NDC member dairy co-ops inside the NDC Dome. The NDC also continues to promote the quality of our pasture-based dairy farming and will showcase the national finalists in the 2015 NDC and Kerrygold Quality Milk Awards at the ploughing. The national award programme identifies and awards our top dairy farmer each year. The achievements of the finalists and winning farm will be celebrated in a campaign to highlight the excellence of Irish dairy farming both at home and abroad. It will be based on the tagline #MadeForThis and will focus on the importance of heritage and the sense of collective kinship that exists in farm communities. These factors are behind the success of every great farmer and at the heart of what makes Irish dairy the best in the world. The national award programme identifies and awards our top dairy farmer each year. The ever popular Photobooth returns to the NDC Dome with a chance to win prizes each day of the Ploughing. You can also test your football skills in an interactive penalty shoot-out zone where there is the opportunity each day to win some spot prizes.